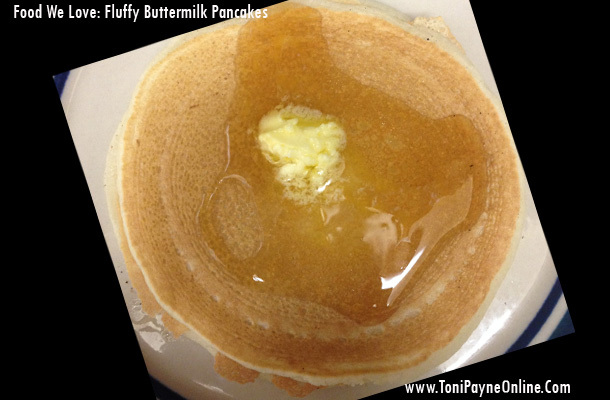 Pancakes are relatively easy to make so I will not be putting up a recipe for this one. This is being filed under “Food We Love.” Today’s breakfast features Fluffy Buttermilk Pancakes graced with a tad bit of butter and some Maple syrup. No, there are no strawberry or other fruit garnishes this time around but it is an option we have played with in the past. If you are looking for good Syrups, the Aunt Jemima Brand is a good one. I had craving for Potato Salad so this breakfast was served with a side of Potato salad (not Pictured because that’s just unusual – lol). Today’s Breakfast was also served with a tall glass of Orange Juice. I wish I could say I bought fresh oranges and squeezed them but I did not. As an alternative, we use the Simply Orange Juice brand because it is touted as being 100% not from concentrate. So what did you have for breakfast? Feel free to share in the comment section. If you missed any of my food series, you can check out “Tonight’s Dinner” How to make Fried Plaintain and Rich Eggs . If you like what you see, do feel free to share by clicking any of the share buttons. Perhaps because I’m Canadian, but once you’ve tried real pure maple syrup, you’ll realize Aunt Jemima is just sugar and colouring and taste like crap.